Twelfth Judicial District Chancellor Jeff Stewart retired in 2018 after nearly 30 years on the bench serving the people of Bledsoe, Franklin, Grundy, Marion, Rhea, and Sequatchie Counties. 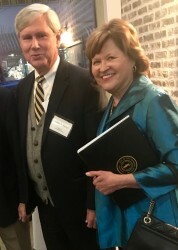 In honor of Chancellor Stewart’s many years of service, friends, family members, fellow judges, and other members of the Tennessee legal community recently gathered for a retirement reception in Winchester. Tennessee Supreme Court Justice Sharon Lee and 12th Judicial District Circuit Court Judge Curtis J. Smith both spoke at the event, lauding Chancellor Stewart for his dedication, compassion, and wisdom on the bench. Justice Lee has known Chancellor Stewart and his family for decades, going back to when her mother served as Clerk and Master of Monroe County under Chancellor Stewart’s father, Chancellor L.F. Stewart. Over those years, Justice Lee has become well-acquainted with Jeff Stewart the “devoted and loving brother, husband, father and grandfather,” as she described him, and also Chancellor Stewart, the fair-minded, honorable judge. One of the things that made his judicial career so remarkable, Justice Lee noted, was not just its longevity, but the consistent excellence of Chancellor Stewart’s rulings. Coupled with this rigorous devotion to getting it right was Chancellor Stewart’s embrace of inclusivity and cordiality in the courtroom. These positive qualities were not lost on Chancellor Stewart’s fellow members of the legal profession. Chancellor Stewart’s colleagues think so highly of him that he was twice elevated to leadership positions in Tennessee’s judicial community. He served as president of the Tennessee Trial Judges Association from 2004 to 2006 and as president of the Tennessee Judicial Conference from 2006 to 2007. A number of Chancellor Stewart’s peers and colleagues attended the retirement reception, including Tennessee Supreme Court Chief Justice Jeff Bivins, Justice Connie Clark, Justice Roger Page, and former Justice William Koch. Many trial judges were also in attendance. Chancellor Stewart was first appointed to the 12th Judicial District Chancery Court in 1989, after a decade in private practice. He was elected to that position in 1990, and again in 1998, 2006, and 2014. He retired effective June 8, 2018.